Of all the most common domestic stains and smells, cat urine is up there with the worst of them. Cats may urinate away from their litter box for many reasons; some physical, some mental and some medical. If the cat is elderly it may have arthritis and find getting into and out of the box increasingly difficult (or even getting to the box). 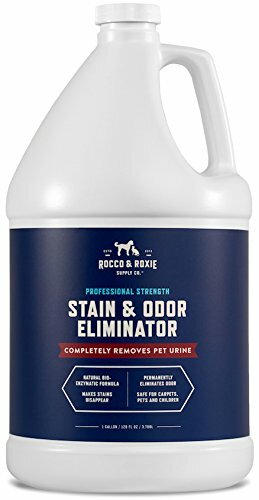 Professional Strength Stain & Odor Eliminator is an enzyme activated pet odor and stain removal product for cat’s urine. It contains naturally formulated enzymatic bacteria that become active when they come into contact with the urine stain. They feed off the ammonia crystallization that occurs when urine evaporates and remove all traces of the stain until it disappears completely. It contains no toxic chemicals, is color safe and does not leave behind a residue when used. It is therefore extremely gentle on household fabrics and has been given a recommendation by the Institute of Carpets and Rugs as being safe for use on all carpet types. NonScents Odor Control Cat Litter Deodorizer is an excellent quality product that eliminates cat litter odors completely. 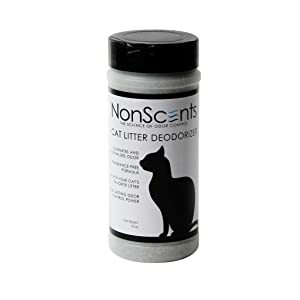 A very different product from the one above, NonScents Odor Control Cat Litter Deodorizer is a single purpose product designed specifically to extend the life of your cat litter and prevent both the litter tray and the surrounding area from smelling of urine. This leaves your pets toilet completely free from nasty smells. In fact, the product itself is also completely scent-free and the formula it contains is free from any chemicals, so unlike other products on the market it is safe to use and safe for your pet. 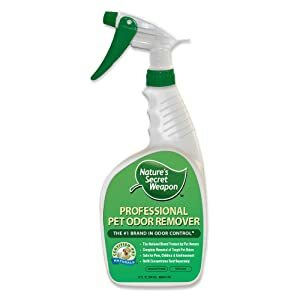 This professional product is concentrated, which means not only is it capable of tackling the worst litter box smells, but a little bit goes a very long way, saving you money. BUBBAS, Super Strength Commercial Enzyme Cleaner is a pet stain and odor terminator. It comes in a gallon size bottle and is classed as enzymatic. 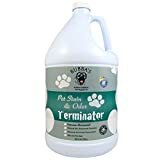 Like our first product in the list, it removes cat urine smells from carpets, rugs, hardwood floors and many other surfaces by using an ammonia formula to eat away at the stain and neutralize the smell. They are so confident of the power of Bubbas that they offer a money back guarantee if the product doesn’t work or you are not satisfied with the results. Not only that, Bubba’s claim that aside from dealing with pet problems, the formula can be used on any number of household stains and smells, including unwanted smells from trainers and shoes, removing grass stains from laundry and even for wiping down furniture and walls to get rid of any bacteria that causes odor in the house. They claim to not only be better than the competition, but proud to be made right here in the USA. Urine Gone Stain & Odor Eliminator is a strong, professional, and swift-acting enzymatic fluid solution, which instantly attacks and deodorizes deep into the fibers of all carpet types. It makes strong claims of stopping cats from going back and remarking in the same place twice. 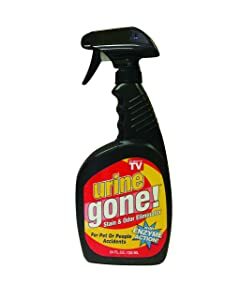 The formula works fast to break-down the smell of urine instantly wherever needed. It is also one of the cheapest of the cat urine odor sprays on the market and can be bought both online and in any good pet store. This makes it a cost-effective method of dealing with the problem. It is marketed as having a lemon citrus scent and works to remove all traces of cat urine. It appears to be the most chemical based of the products so far, but this may also mean that it is the most powerful and effective at combating unwanted smells and stains throughout the home as well as remove cat urine from clothes. 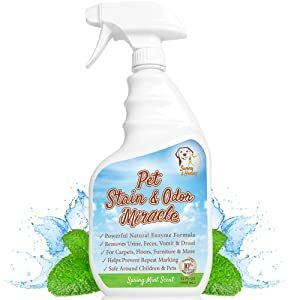 Pet Stain and Odor Miracle is another enzyme Cleaning product for use on cat urine, feces, vomit and other bodily fluids. Rated as a number 1 product for 100% removal of pet stains and odors, it is a multiple surface cleaner for use on everything from carpets and hardwood flooring, to furniture and rugs as well as pet beds and even car upholstery and leather items. It claims to be both child and animal friendly with a natural formula that is a safe and effective way to clean up any pet made mess around the home. Like many other products of this nature, they are so confident in the cleaning power of their spray that if you’re not 100% satisfied with the results then they are happy to issue a full refund with no questions asked if you return the bottle and its contents to them. This is offered strictly on a 60-day money back returns policy. 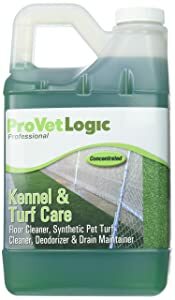 ProVetLogic is an all-round formula for kennel care, pet and floor cleaning, synthetic turf cleaning, deodorizing and drain cleaning, It comes as a concentrated liquid in 64 ounces bottles. The company claims it to be a high performing bacteria and enzyme enriched cleaner for multiple uses by in both domestic and business environments. Kennel care has been recommended by industry standard manufacturing firms for cleaning a wide range of industrial surfaces including concrete floors, ceramic bathroom tiling, grouting, brickwork, and rubber flooring with both hand and machine applications. They do not give any information as to the toxicity of the product, but from reading what they have said it seems apparent that this is not an organic mixture and therefore due care and attention should be observed when using this concentrate in any job. Nature’s Secret Weapon is another professional feline, canine and all-round pet urine destroyer and odor removal product. It’s natural Enzymatic stain and odor eliminator is one of the most popular national branded products in the US. This brand is famous nationwide and available both online and in-store for consumer convenience. With its all-natural recipe, this advanced formula makes claims to work where all other pet urine eliminators fail to permanently remove even the strongest odors from all household surfaces. These include hard floors, carpets and rugs, fabric and other materials. The reverse of the bottles labels warns that this product should be kept out of reach of children and if swallowed urgent medical attention should be sought. Additionally, it is marked as a skin and eye irritant with similar warnings that should it come into contact with either, then the affected area should be rinsed with warm water and again medical attention sought. 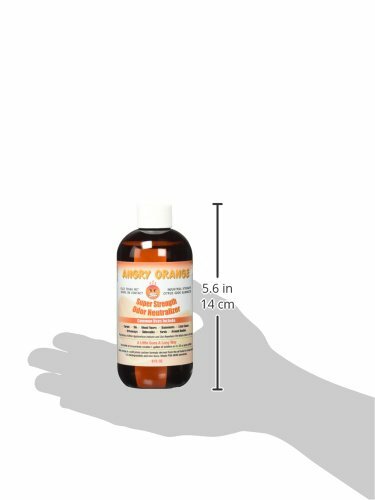 Angry Orange Pet Odor Eliminator comes in an 8-oz. bottle and is a strong, industrial pet deodorizer. Its concentrated formula makes up too four 32oz. bottles in total (approximately 1 gallon), which neutralize odors fast and effectively. 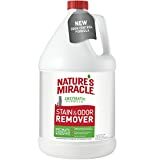 This quality odor remover can not only be used on fabrics, carpets and hard surfaces around the home, but also says that it tackles smells in yards, around gardens and anywhere else that pets may decide to go to the toilet. The product is recommended for safe use on pet products such as little trays, carrier, bedding, and clothing. Not only is it safe for you and your pet, but it destroys all traces of ammonia and methane so that cats (and other animals) do not return to the same place twice. They are so confident of this, that they offer a 100% guarantee on satisfaction or your money back. 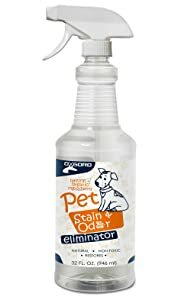 Organic Pet Stain Odor & Remover is a strong and professional odor eliminating formula produced by Oxgord. It comes in a portable and easy to use 32 oz. spray with wide angle nozzle. Its ammonia based enzymatic eliminating formula is ideal for removing cat and dog urine stains around the home. This deodorizing cleaner is an effect 2-in-1 product, which safely tackles all pet mess around the home, removing it from carpets and upholstered furniturewithout leaving a trace or any unwanted lingering smells. The manufacturers, like several others, offer a 100% money back guarantee on quality. If you are not totally happy with your purchase, you may return the bottle and its contents at any time after purchase and have your money back. As you can see from reading this article, there is a wide range of choice on the market and a lot to consider when looking for the right stain & odor removers for your needs. Depending upon the frequency and location of the problem you have; the environment the problem is in and your own personal needs and point of view, different products suit different consumers. Also Read: What’s The Best Air Purifier for Cat Litter Dust? Some of these products claims to be 100% safe for the environment, children, and pets, while others such as Nature’s Miracle are frank in stating warnings for their application and use. It follows that those products that carry a warning and probably more powerful and effective at tackling tough and persistent problems, but more than likely only suitable for commercial use and not ideal for confined spaces such as apartments or in situations where young children are present. Some of the products in the range are industrial formulas designed as all-round products for use not just on urine stains, but any animal related cleaning care both inside and outside the home. ProVetLogic is the best example of this, being marketed as a kennel and turf cleaning product for all applications. Then there is a choice about buying ready prepared mixtures, which are pre-prepared and ready to use immediately, compared with concentrates, which require the user to measure out and mix with a specified amount of water before they can be applied to the affected area. These save both time and money, but also requires additional steps to undertake before being administered. If real ease of use is high on your list of priorities, then choosing a product that come ready mixed and in a spray bottle may be the best course of action. Four of the ten products listed here did come in such a bottle and most households tend to go for these over the concentrate, which is more suitable for people running commercial ventures or those with several animals at home to care for. Spray applicators also have the added advantage of being most suitable for small areas, areas that are hard to reach and for fabrics. For example, curtains, soft furnishings, and bedding are much more easily dealt with using a spray bottle to get to vertical stains, while mixing concentrate into a mop bucket is easier for covering large areas of hard flooring or outdoor spaces such as kennels and runs. There is one product on the list, which is completely different from all the others and requires a special mention. NonScents Cat Litter Deodorizer is a powder rather than a liquid and is therefore set apart from the other products in this range. Rather than cleaning up stains, it is more suitable for preventing smells emanating from the cat’s litter box itself. This is therefore really a secondary product in that you would need one of the others to deal with external mess, but at the same time it’s a useful tool to keep the litter box fresh and encourage your pet to continue to use this space for its only personal hygiene routine. Whatever product you decide to invest in when dealing with the problems surrounding urine stains in the home, the price range of these are relatively narrow. Also Read: How Much Does it Cost to Own a Cat? Prices start at just under 10$ and rise to around 50$ for the commercial brands that come in larger sizes (gallons). A price of 10-20$ for 32 oz. seems to be the standard purchase amount. Select the most appropriate brand for the task at hand and deal with pet mess quickly and effectively every time with any cat urine removal product on the market. I have countless of times and to remove Cat urine is difficult! The smell is always there but the products you have stated will work wonders!